LaGrange Products also excels in custom fabrication, and boasts one of the most efficient, experienced and best-equipped fabrication shops. Our design and engineering team will turn your prospective custom job into reality. Custom fabrication work includes reactor vessels, expansion tanks, jacketed and specified alloy vessels, process tanks, filtration vessels, heat exchangers and stainless steel vessels, surge tanks, hydraulic reserves, transportation vessels and many other types of vessels. 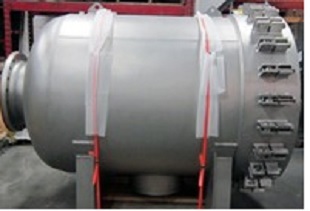 Our experienced engineers use the latest design tools and CAD software to fabricate pressure vessels that are designed to meet ASME Section VIII Division 1. Our fabrication capabilities combined with our engineering expertise have allowed us to diversify our business. We have the capability to work with many different materials and a wide range of dimensions. When the scope of a project goes beyond our vertically integrated in house machining capabilities, we sub-contract with strategic partners that also share our dedication to innovation, quality, service, and on-time delivery.